A drone used by police on Merseyside crashed into the River Mersey during a routine training exercise. The Unmanned Aerial Vehicle (UAV), which was fitted with CCTV, apparently lost battery power while being flown by officers in Aigburth in February 2010. Attempts to make an emergency landing failed and it crashed into the water. Merseyside Police said it would not replace the £13,000 drone due to problems with its performance and the cost of training staff to use it. It said full aerial cover and support was now provided to police by the North West Air Operations Group. A spokesman said: "Despite the conditions a search of the area was undertaken but unfortunately the unit was not found. "The force has since received compensation from its insurers to cover the cost of the vehicle." 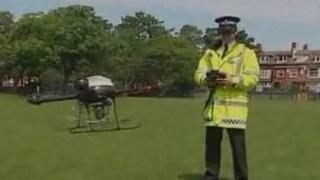 He added: "Initially the force identified the potential benefits of a UAV within operational policing. "However, during its use officers recognised certain technical and operational issues including staff training costs and the inability to use the UAV in all weather conditions. "These issues in conjunction with the current financial climate resulted in the decision being made by chief officers not to replace the unit." The remote control helicopter came into use in November 2009. It was also fitted with thermal imaging equipment and was used by police for criminal surveillance. When it was launched police said it could be used for anything from hostage situations to monitoring large public events. Shortly before the crash, police were forced to take it out of service temporarily as they discovered they were using it without an appropriate licence. They needed permission from the Civil Aviation Authority (CAA) to fly within 50m of people and within 150m of buildings. A licence was later granted by the CAA, but soon afterwards the device plummeted into the river and could not be found.